The garden of the Hesperides was where Hercules had to go to find the golden apples, references to it in Italian Renaissace gardens are a symbolic way of comparing the garden to paradise, a way of achieving imortality through hard work. So this garden is, for me, my paradise and certainly the hard work in achieving it will bring its own reward. We bought the partly renovated casale at the end of 2007 with the intention of creating a garden. The property faces south but is open to the countryside in every direction. Apart from summer drought (there is usually no rain between June and the end of August) our and the plants main problem is the summer wind from the west – the direction of the sea, but not salt laden by the time they reach us; and the bitingly cold winter winds from the north (Tramontana) and north east (Grecale). 2. The cost of pumping water from the well. We use water to irrigate the vegetable garden on a daily basis but some parts of the garden receive only rain. The ground is tufo, a soft volcanic rock that is very fertile, free draining but does retain water deep down. I am inspired by the wonderful Renaissance Gardens in the area, the superb planting of Beth Chatto and the naturalistic mass plantings of Piet Oudolf. I love grasses and find these very good tempered and beautiful for most of the year. Welcome to my garden of the Hesperides. wonderful blog. I love grasses too. They are indeed good tempered and lovely most of the year like my husband. Christina, you (and Richard) did such a wonderful work. Thank you, please come and visit soon. Thank you for visiting my blog and now I have your website I will be following you with every stroke of the spade and snip of the secateurs. My challenge here in Umbria is very similar to yours in Lazio: whilst we d not have sea breezes the lake has an effect on the weather so we often miss out on rain that falls elsewhere in the region. Thank you for visiting my blog too. As we are geographically quite close it will be great to compare flowering periods etc. I also miss out on a lot of the rain that falls on Viterbo, only five km away. Like all gardeners I perceive my difficulties as being greater then everyone else’s; certainly the sea ‘breeze’ is than more than just a breeze which would be lovely in the summer. It isn’t salt laden by the time it arrives here but hot drying wind does more damage in this garden than the cold north and north-east Tramontana and Greciale. Yes do let’s stay in touch – my garden is a lot more haphazard than yours, but I certainly share your principles. My icon is Olivier Filippi – he, like us, has the hot dry summers plus cold winters to contend with. 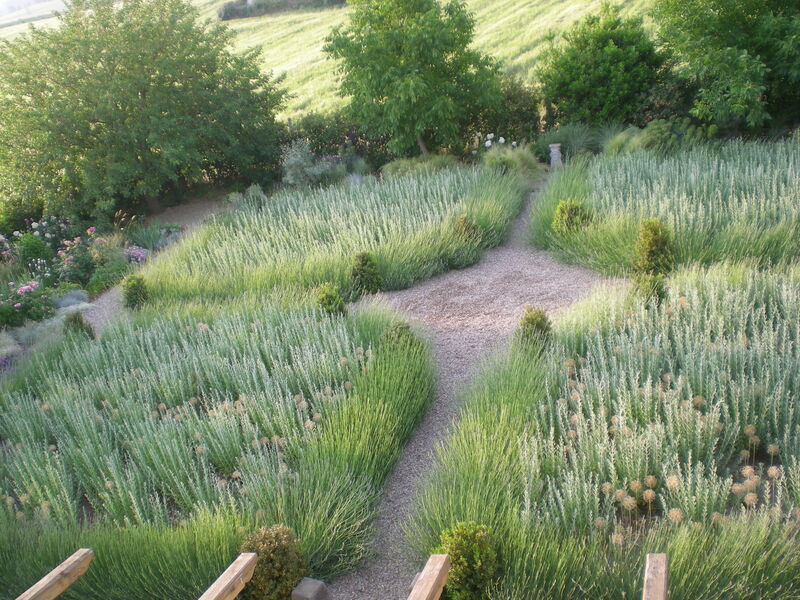 I also admire Beth Chatto and plant a lot of grasses to create ‘natural’ effects. At the moment I am being driven mad by the weeds that are roaring out of the ground with the wet weather and it can be very hard to weed them out from the ornamental grasses. A lot of my garden is stones and clay and varies around the plot. I am very envious of your veg plot and will follow your progress with keen interest as I am just about to have some raised beds built here for me – I have tried digging ordinary beds in various parts of the garden without much success; wild boar, procupine and weeds all conspired to defeat me. I think a properly laid out raised area is definitely the way to go. Th eproject is well behind schedule because of all the bad weather but with any luck I will be able to pop in a few tomato & courgette plants before its too late. I will post more photos of plants in flower as they arrive to compare notes. Beth Chatto has always been an inspiration for me, her choice of plants is always right. I certainly share the philosophy “right plant in the right place”. I certainly recommend raised beds for vegetables – it just makes hte whole idea more do-able; less intimidating. from Ken. It would be nice to have on this page some photos showing the structure of your garden so that readers can return here to see the context of your photos in your posts. And even a copy of your garden design plan. For example. when looking at say the photos of your serendipity poppies in a post it would interesting to know where they are in the garden. I think you had better just come to see it Ken. Your garden is a constant inspiration. Thank you for sharing the photos, the recipes and your experience! Thank you Donica. Tell me what you are doing in your garden. Ciaooo, magnifico blog e bellissime foto! Christina, I came across your blog when I bought a house in Sabina, Lazio with my partner one year ago. I am so impressed with what you are doing and am thrilled that there is some real gardening going on in this part of Italy. We are just starting to lay out some of the gardens by simply making huge lasagne of: sheep muck from a local farmer who makes lovely pecorino; cardboard scavenged from the srreets of Rome; and straw, when I can find someone kind enough to give me a bale or two. I am hoping that after one year the ground might me a little more forgiving to my spade! Then the planting will begin. Anyway please do get in touch – I would absolutely love to visit your garden sometime and I will probably need to pick your brains too!!! veramente un bel blog…mi pare di capire che sei italiana, anche se scrivi in inglese…il mio inglese lascia molto a desiderare, quindi ti saluto in italiano..però ti leggo volentieri: post sempre interessanti e pratico l’inglese…che chiedere di più? Your garden sounds lovely. I hope you don’t mind but I saw your comment about ‘Elizabeth and her German Garden’ on dig the outside. I just wanted to say hello to a fellow admirer of Elizabeth Von Arnim (I’ve never encountered one before). I think she’s wonderful, ‘Solitary Summer’, was all about her garden and was very good as well. No problem, I hope you’ll like it! I adore Italy. I’m so glad to have found your blog! Thank you for sharing this. Your garden looks so well established already, timeless. I have been surprised at just how quickly everything grows here. This year more than ever with warm temperatures and lots of rain! Thanks for visiting my garden Michelle, I visited you too and hope to join your nature meme soon. Your gardens are lovely, and thank you so much for the pictures. My husband and I have moved from a region of central California that had a climate very much like you describe yours, and had great luck with many of the plants you show. Now we are in a slightly mountainous region of Tennessee. This new property is a blank slate of sorts, and would it make sense to say that after working the other place for seventeen years, I feel lost? Again, thank you for your pictures. They brought me peace, and a new sense of purpose. Perhaps in our travels, we will be able to see your lovely gardens in person. Starting to garden in a different place and climate is exciting if sometimes a difficult proccess. Love your garden and your gardening ethos! I, too, am a huge fan of grasses and of Piet Oudolf’s gardens. I’m lucky enough to have visited one of his gardens over here – Scampston Hall. Inspiring! Looking forward to following your blog, but first must get the map out, to find out where your garden is! It will be interesting to see what gardening in Italy is like. Welcome, I hope you enjoy your time in my garden. I think WW was started by WordPress to encourage more posts. There are no rules, lots of us even use some words!!!!! Do join in. I decided to post views I don’t always show in other posts or what is particularly good that week but really it can be anything you like. Obviously in theory it is just one or more images and a title, you don’t have to link to anyone so its easy. Brilliant – thank you! I’m in love with your garden! And your blog!!! Such wonderful photos and a generous sharing of your thoughts and knowledge. Thank YOU, without comments there wouldn’t be so much pleasure in writing a blog. what a beautiful blog! and what a beautiful garden it must be! Is it possible to visit? Thank you! Thank you Erica. The garden isn’t open, but if you would like to visit I’m sure we could arrange it. Hey there Christina! Just browsing around the blogosphere, finding some fun and interesting blogs to follow to make some new friends in 2016. If you like, hop on over to my world at http://www.thatssojacob.wordpress.com, and if you see anything you like, comment or follow! Have a great day and happy new year! Hi Jacob, nice to hear from you, thanks for following My Hesperides Garden, I hope you enjoy your time here. Hola Christina¡ su jardín es precioso, las lavandas están grandiosas al igual que el resto. Gracias por las fotos son preciosas.Saludos margarita141. Hi Margarita, I don’t speak Spanish but I think I understand what you said. The Lavender formal beds were removed last autumn but there is still lavender in the garden in other borders. Wow! Your garden is absolutely stunning.